License: US$2.99 Compatible with iPhone, iPod touch, and iPad. Requires IOS 5.0 or later. As an amateur astronomer and a volunteer with Project ASTRO, I regularly use the concept of scale to help teach astronomy and engage our students in visualizing and grasping the immensity of our universe. I typically use examples scaled in the dimension of physical length, area, and volume to assist in illustrating the distance and sizes of planets, our solar system and neighboring stars and galaxies. The Cosmos Story application approaches this concept of the size of our universe in slightly different way by using the dimension of time as related to the speed of light. That is, light travels 186,000 miles per second or 300,000 kilometers per second. Working in this dimension, the distance between the Earth and our Moon is a little more than a second and the distance from the Earth to our Sun is a little more than eight minutes. 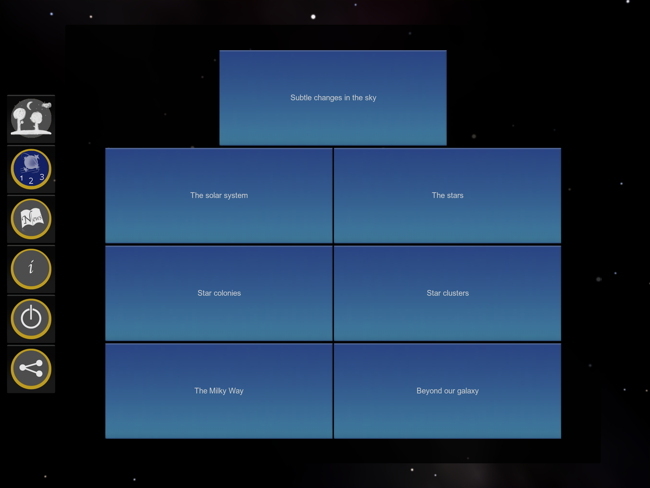 The application presents an interactive audio-visual tour of our universe beginning with our view of the sky from Earth. Unlike similar astronomy applications, the camera is not used so you can use it both indoors or outdoors. For my review of this application, I used my WiFi only iPad (generation 3), and both my iPod touch players (generation 4 and 5). With my iPad, I can scroll around the sky by moving and pointing at the sky using its built in sensors but on my iPod touches I can only scroll the sky manually. Both my iPad and iPod touches have a three-axis gyro and an accelerometer so I don’t know why they work differently. I was unable to find a setting that could resolve the difference so I requested more information from the developer but as of this writing I have not received a reply. 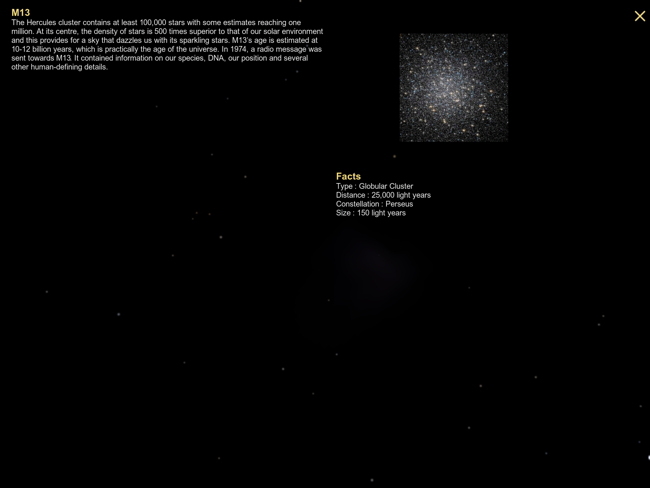 When you open Cosmos Story you are presented with a simple menu as shown in figure 1. The icons on the left (from top to bottom) provide the user with the selecting day or night, chapter selection, news, application information, quit, and share options. The audio slider bar on the bottom allows you to move forward and back in the audio track. The right hand graphic shows the audio chapter you are currently hearing. The menu displays will turn off as a function of time but can be cycled on and off by simply touching the screen. Selecting the Chapter icon brings up the display shown in figure 2. This allows you to select and begin your Cosmos tour and any of the seven available chapters. Bringing this menu up anywhere in your tour you can quickly change to a different chapter. If you quit the application and then restart it, you are given the option of continuing where you quit or starting at the beginning. Starting with the first chapter, Subtle changes in the sky, you are presented with the sky based on your location and time. As I mentioned earlier, since the application does not use the iOS device’s built in camera, you can view the night sky either indoors or out. Selecting the day/night setting you can view the sky during daytime without the daylight being presented. The narrator, speaking with a pleasant British accent, presents you with an explanation of what is going on in the sky and begins explaining the distances we are in light travel time to the various objects we will be visiting and learning about. As the application proceeds into each of the chapters you are given opportunities to interact and follow pointing directions to locate specific objects in the sky. These include the visible planets in the sky at your location and time, also deep space objects such as open and globular clusters of stars, and distant galaxies. 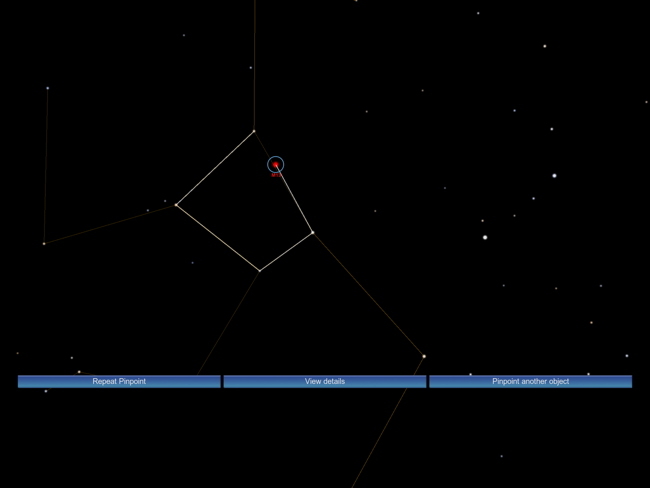 As an example, figure 3 illustrates the beginning pointing arrow you are presented with that shows the direction you need to point your iOS device to locate the globular cluster M13. 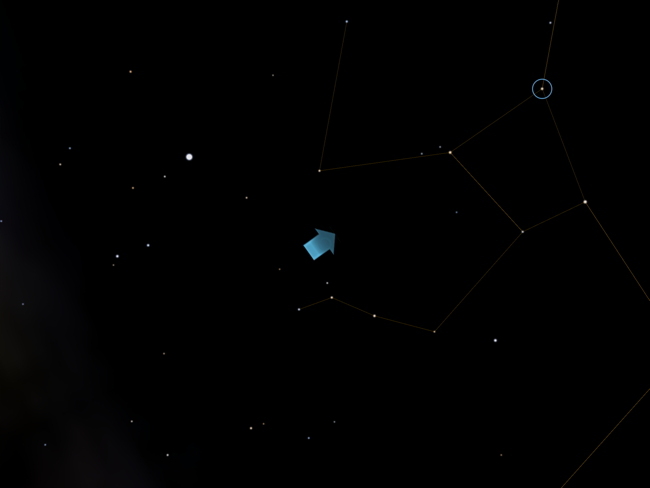 In the case of my iPod touches, I simply drag the scene of the sky towards the pointing arrow. A small blue circle will indicate the point you are steering to. As you approach closer to the small blue circled area the blue arrow changes to brown and a large but diminishing brown circle appears as shown in figure 4. Your objective is to continue approaching the blue circle until brown circle is center and shrinks to fit over the blue circle. 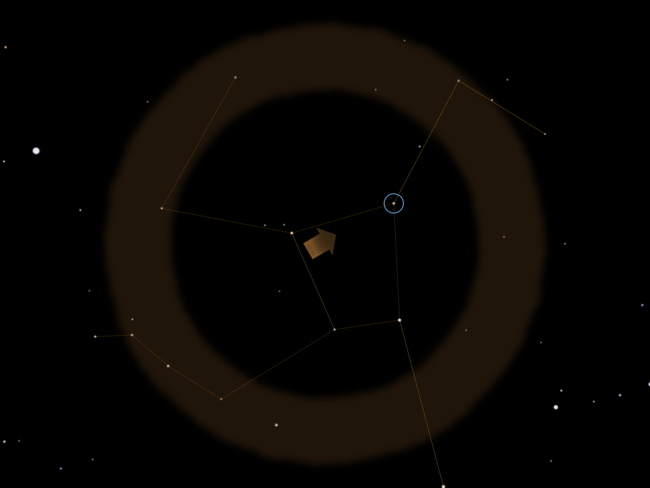 When you succeed in aligning and shrinking the brown circle over the small blue circle the application in this example demonstrates how you would then star hop to the location of M13 as shown in figure 5. At this point, you are presented with three options that you can interact with the application. You can repeat the pointing process you just completed, view the details about the object M13 you just arrived at, or you can pinpoint another object to view. Figure 6 shows the information you are presented with when selecting View details. The Cosmos Story comes with a short video user manual that provides a brief audio visual presentation of how to learn and use all of its functions. You can also interact on the web via the Cosmos Story website. You can keep and share each of your journeys, explore new links, view larger images of deep sky objects, and comment and share the discoveries you made with the Cosmos Story with other users. These examples I presented illustrate just a portion of the capabilities of this application. One can spend hours exploring the application’s capabilities and enjoy listening to the narrator as you tour the cosmos. The application is a British translation from the original French program so there may be some spelling and grammatical errors. For example, in the description of M13 in Figure 6, the word centre is the British spelling for center. Spelling and grammatical errors were noted at the iTunes Preview for version 1.0 but not for version 1.1. I didn’t see any, other than the British spelling, in my review trials of this new version. 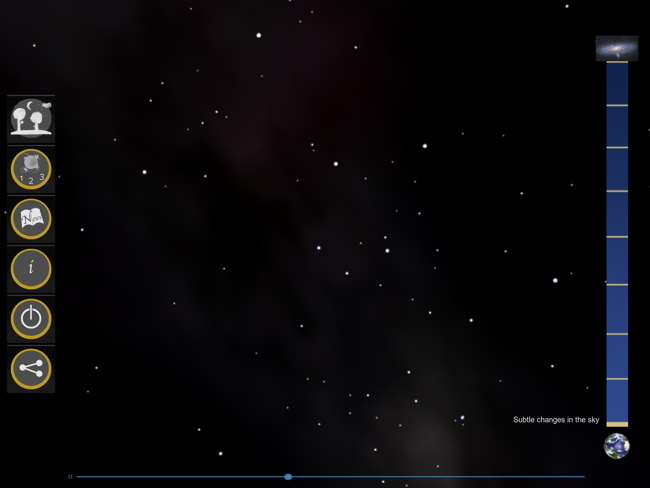 This latest version 1.1 added support for the southern hemisphere sky, providing a worldwide guided tour capability. The price, in my opinion, is about right for this type of educational application. I’m still not sure why the application operates differently on my iPod touches than on my iPad. Since there is no explanation provided within the Cosmos Story, this could be a simple coding error. 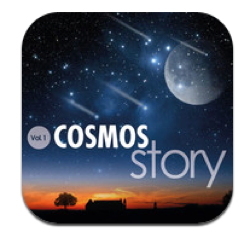 Therefore, I am awarding Cosmos Story Vol1 a MyMac.com 8 out of 10 review rating.